When you're young and stupid, business travel sounds like a great idea. Air travel, free food, maybe a neat name tag if you're at a team building or sales convention. The reality of business travel is that since you're wherever you are to work, all the touristy stuff you had planned to do takes a seat right next to you in the back of the van that's carting you around. It's still pretty cool that you're considered worth the airfare, lodging, and the name tag, however, and if you can manage some downtime, you may wind up eating something that will never show up on the menu at Applebee's (although I just got an email from Uno Pizza about a Moroccan soup). You might also get kidnapped. 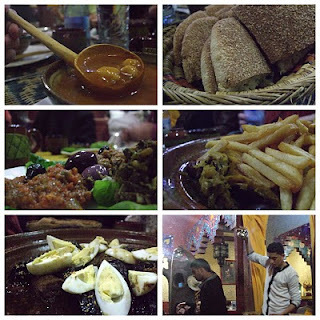 This past week's sojourn to Morocco was a blitzkreig of interviews, harrowing cab rides, and language barriers. When we finally hit the pause button to eat, we found a wealth of porkless options that showcased the amalgamation of French and Middle Eastern cuisine typical to the region, a place where a lemon sauce is so sour as to be bitter, veal is actually short ribs, and every meal comes with French fries (a good thing). More pictures after the jump. 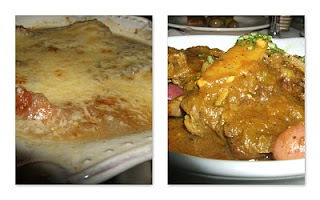 French onion soup served in octagonal crockery followed by a tagine not served in a tagine. In the onion soup, a soggy piece of white bread; in the tagine, lemon rinds and olives. This meal was a disaster. I even tried to change my order and fucked up some other dude's order. If it wasn't for the Casablanca beer (which tasted a lot like Kingfisher/Taj Mahal), I would have cried myself to sleep. 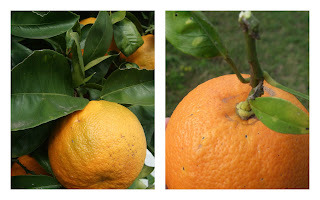 The next afternoon, I picked some sour oranges. Mixed grill and something called Dafina (we were told this plate was made especially for Jewish people. I don't know what that means). Five skewers and a lamb chop. Cubed and grilled meats are such a delight. These ones were particularly succulent, even the liver surprise. 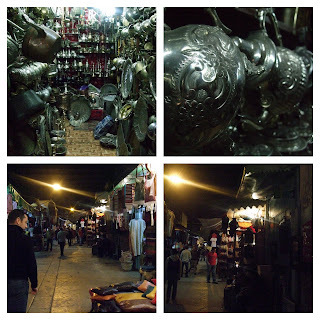 The sights of the Medina, a generic name for a maze of storefronts hawking anything from knockoff football jerseys to sheep brains. It was Canal Street on steroids. I was told that Rabat's Medina was on the small side. I still got lost. I was also told by a lighter-wielding old man that I was "not a God" because I didn't want to see his spice store. Jerk. 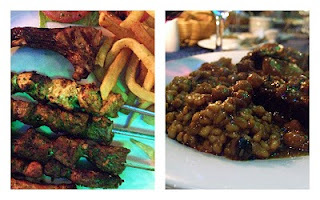 Finally, a traditional Moroccan meal. Harira, a rich tomato-based soup served with plenty of bread for dipping, assorted salads--something like spinach but not really spinach, stewed eggplant, stewed tomatoes and peppers, and two tagines actually served in tagines--chicken and herbs topped with French fries (at least the cooking vessel was traditional), and "veal" with prunes in a sauce scented with cinnamon. I didn't quite understand the hard-boiled eggs, but I still ate them. This was the highlight of the evening. The slow cooked beef melted ever so slowly in your mouth, and as it dissolved gave way to a beautiful cinnamon finish. At the end of the meal, mint sweet tea poured from such great heights and served at the perfect temperature. The last meal of the trip (aside from the excuse for food they serve on the plane) was Italian, likely for no other reason than it was 20 steps from the hotel. Even without speaking the French or Arabic, we knew that the owner was bullshitting when he claimed the chef was Sicilian, but the food was not any worse for it. This horribly photographed gem was canneloni stuffed with foie gras and pesto and topped with a sauce made with foie gras. It was ultra rich. I had to cut it with multiple glasses of white wine, which can get expensive when your host country does not have much of a drinking culture. We did manage to track down an Irish Pub, and we were lucky enough to spot the elusive Moroccan Elvis belting out a Sinatra classic. This moment, caught on video, made the whole trip worthwhile. Buen provecho.